No hardworking mechanical device can last forever. 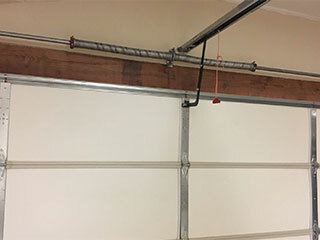 Seeing as your garage door springs are under a lot of tension on a daily basis, it's only a matter of time until they eventually wear out and break. When this happens, or even before that, they need to be replaced as quickly as possible. This is not a task that should be performed by inexperienced DIY enthusiasts, so make sure to have our technicians help you. What Happens When A Spring Breaks? Because these components support the weight of the door, it can’t be opened without them. Although many people think that the opener bears the majority of this weight, the springs are actually the ones that are in charge of that. This means that when one of them breaks, you could find yourself with a door that can’t be opened, a hugely frustrating problem when you’ve got somewhere to get to urgently. Our team prides itself on quickly carrying out broken spring replacement and getting your door moving again in as short a time as possible. Because a broken spring is so inconvenient, we always recommend that you get them replaced before they break. It’s important to watch for the signs that these units are beginning to weaken; if the door wobbles or starts to sag when it moves, then you may need a new set of torsion or extension units, depending on the type of door you have. Torsion springs will start to squeak when lubrication maintenance is in order, and the door may start to become unbalanced when their tension starts becoming slack. For emergency spring replacement and expert maintenance services, there's no one better to call than our professional team. Contact Garage Door Repair Darien today and our experts will quickly solve whatever problem you're dealing with.